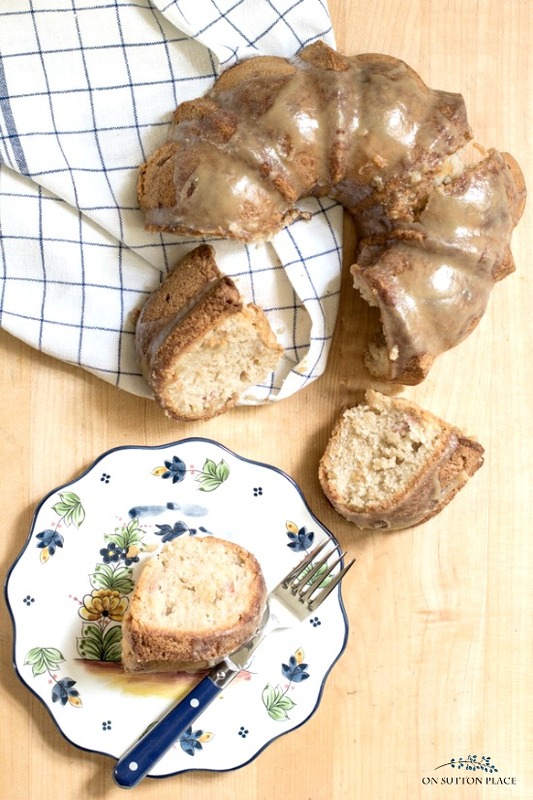 Made with finely chopped fresh apples, this Apple Bundt Cake Recipe is sure to please everyone. Includes a delicious glaze and makes enough to feed a crowd! Old fashioned, tried and true recipes are sometimes the best. They don’t call for odd ingredients and are usually simple to make. Back in the day, there were no kitchen gadgets to make the job of baking easier. This meant that homemakers needed straight-forward and hearty recipes to feed their hungry families. 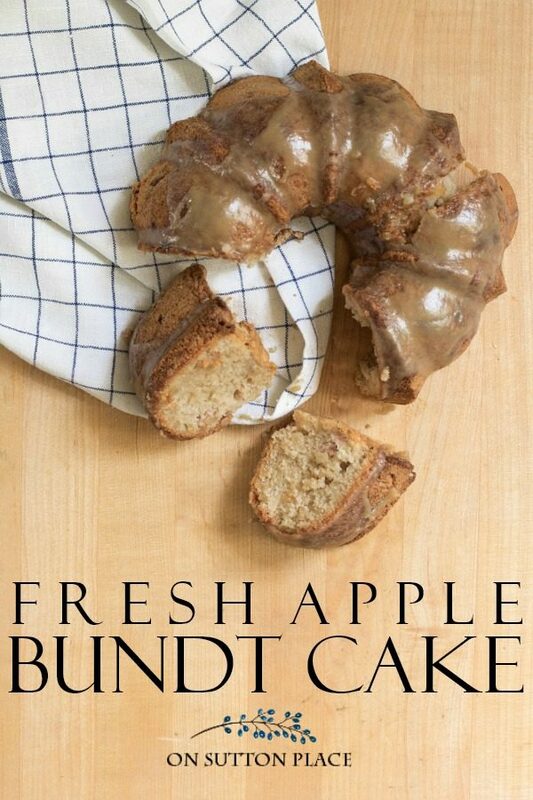 That’s exactly what this apple bundt cake recipe is. It’s one of the best cakes I have ever tasted and was so easy to make. 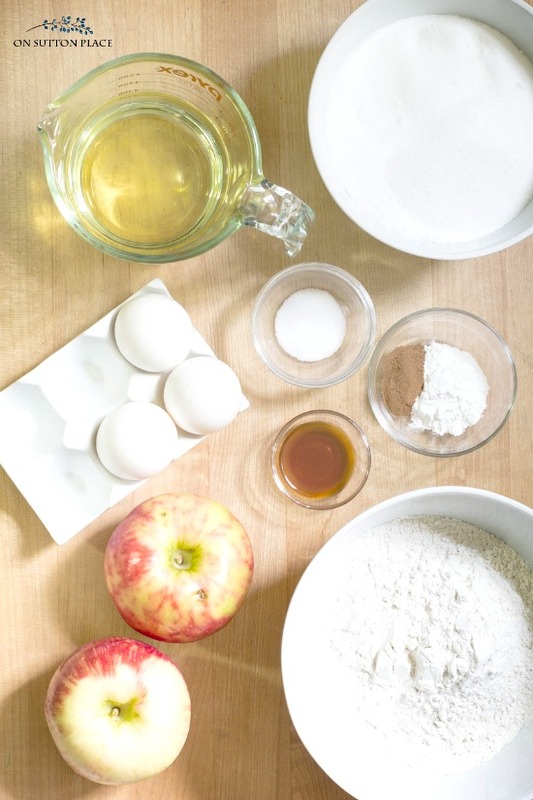 The ingredients are all basic pantry items with the exception of the apples. I used Honeycrisp apples but definitely use the apple of your choice. I didn’t peel my apples before chopping. I diced the apples into very small chunks so the apple peel wasn’t noticeable at all. The batter was a bit stiff, but poured nicely and filled the bundt pan perfectly. I use the Nordic Ware Anniversary Bundt Pan and it’s the best. Cakes bake evenly and it’s super easy to clean. Most of my baking pans have been gifts from my family, but I splurged and bought this bundt cake pan for myself. If you decide to treat yourself, you won’t be sorry! 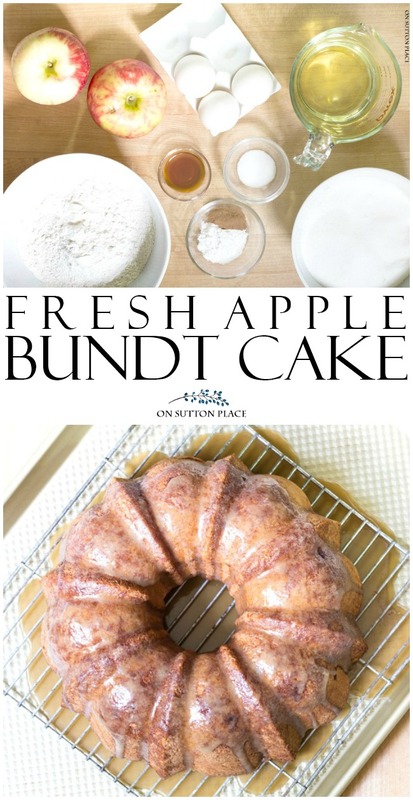 About the glaze…you can definitely skip this step if you are pressed for time and simply dust the apple bundt cake with powdered sugar. The glaze is, however, amazing. 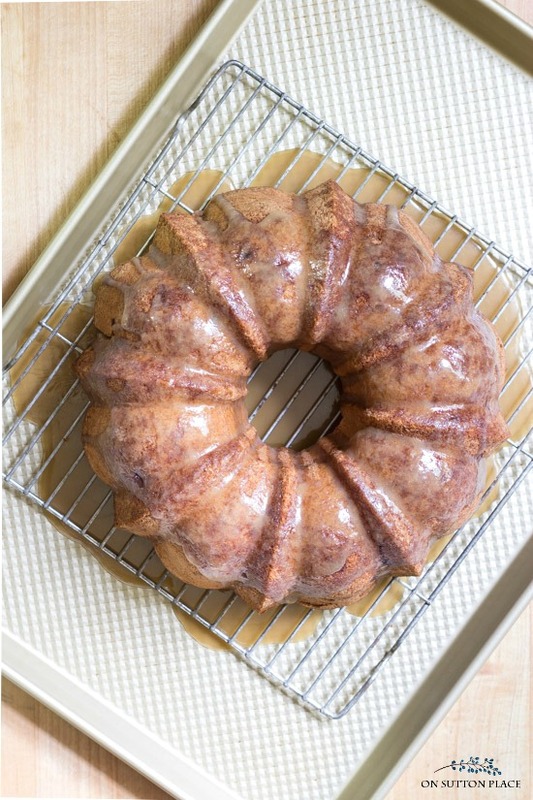 It really sticks to the bundt cake and adds one more layer of texture and sweet goodness. This is the perfect cake to take to any gathering or potluck because it feeds at least ten people, possibly more if you cut the slices a bit thinner. Or you can make it just for your family because it stays fresh for three to four days in an airtight container. After the first day or so, store the container in the refrigerator. 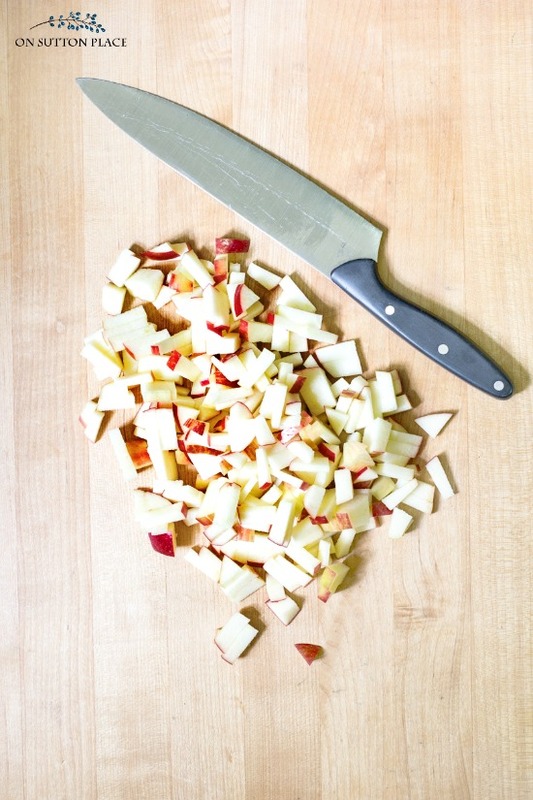 Finely chop the apples. You should have enough to equal about 2 cups. Set aside. In a separate bowl, sift together flour, baking powder, salt and cinnamon. Set aside. In the bowl of a standing mixer, or in a large mixing bowl with a hand mixer, combine eggs, oil, sugar and vanilla. Beat 2 minutes. In two batches, add the flour mixture to the egg/oil mixture beating well and scraping sides of the bowl between additions. Fold batter into prepared bundt pan. Bake for 45 minutes or until a knife inserted in center of cake comes out clean. Cool 10 minutes in pan. Put out onto cooling rack. Cool completely. While cake is cooling, prepare the glaze. Melt 4 tablespoons butter in a sauce pan. Add ½ cup brown sugar and whisk until mixed. Slowly drizzle in 1/3 cup milk while still whisking. Bring to a boil, stirring constantly. Boil for 4 – 5 minutes. Remove from heat and let cool. The glaze will thicken as it cools. Place cake (still on the cooling rack) on a large cookie sheet. Pour the glaze over the cake and let harden a bit before serving. I use Baker's Joy to prepare my baking pans. A dusting of powdered sugar can be substituted for the brown sugar glaze. Looks so delicious as ALL your recipes do. My husband is diabetic, so I try to find desserts for him, ( he LOVES anything apple) and was wondering if you think I could make this with Stevia or Splenda? I’m pretty sure I could use the Splenda brown sugar for the glaze. Hi Paula! The honest truth is that I don’t know. I would suggest trying Splenda first because the substitution is 1 cup to 1 cup. So you would use 2 cups of Splenda. If you try it, please let us know how it turns out! I made this cake today for our church fish fry and it was a huge hit! I have had the recipe sitting by my apples for a long time just waiting for the perfect occassion for it to make its debut. Well, everyone wants the recipe, so it is not my secret any longer. 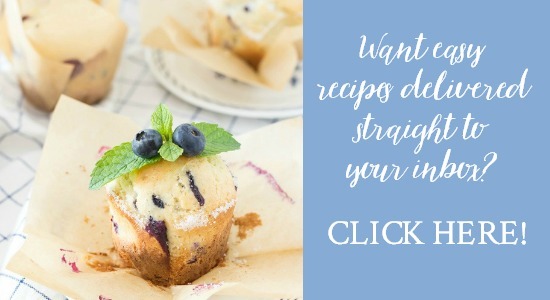 I shared your blog for the recipe and encouraged everyone to look it up. You have so many diverse topics in your posts and i enjoy each one. I just wanted to let you know that I enjoyed the cake and will be making it often. This sounds delish,can’t wait to” try,thanks for sharing. I am out of town…but cant wait to make this. Proud to say Honey Crisp apples were developed here at the University of Minnesota. Wait until you taste our new First Kiss…another great MN apple…lucky me the orchard 10 minutesfrom my home was chosen to initiate its production. Pricey…I paid $16.95 for 20 apples that were second grade. Made this cake today and it is not only quick and easy but tastes wonderful! The brown sugar glaze sends it over the top. I made the mistake of letting my glaze cool off a little too much before putting it on the cake so although mine is not quite as pretty as yours it tastes heavenly! Ok, anyone who reads this comment should make this cake. I baked it first time 2 years ago from OSP and made it 5 weekends in a row! Yes I did. You can thank Ann once you get hooked too! It’s a great anytime dessert but fantastic for fall. Excuse me as I go start baking. Enjoy! Oh, forgot to add that I make the glaze each time and it’s unbelievably delicious! Like melted caramel. Yum! Looks beautiful and I bet tastes delicious.Years ago I used to bake bundt cakes all the time.Hard to move on to fall when Florida weather is in the 90’s.Enjoy your Labor Day weekend. That cake looks just delicious. I just printed the recipe and can’t wait to try it. It is almost time for us to go apple picking for applesauce and I will surely try this recipe.